About a week ago, I was lucky enough to be invited by Clemance Harvey PR to dine at Byblos, one of the eateries forming the row of restaurants next to the river at the WTC Wharf. 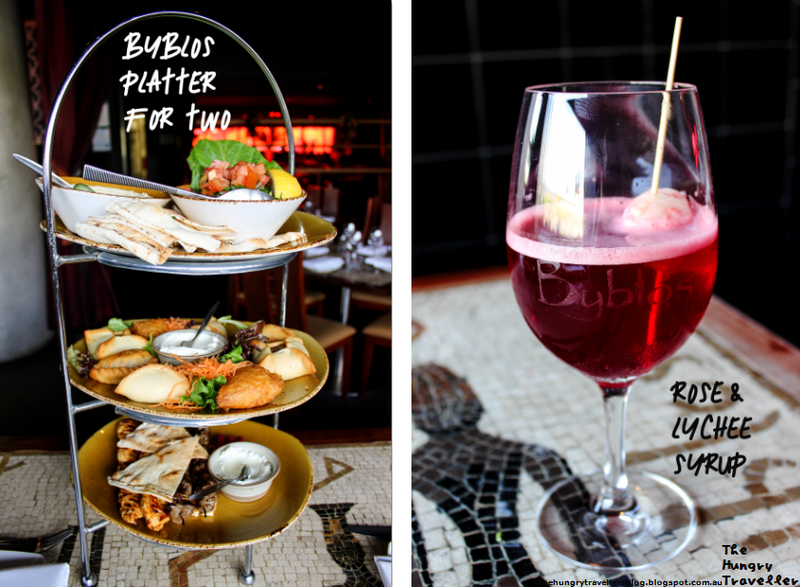 Byblos originated from the sunny state of Queensland and has been known for its exotic Lebanese cuisine and award-winning bar, so I was quite excited for lunch. I arrived at Byblos at 2 o'clock for a late afternoon meal, so it took awhile to flag a waiter given the quiet hour at the restaurant. But once I did get his attention, he was very friendly and recommended a delicious dish from the grill menu. The char-grilled jumbo prawn was succulent and flavoursome, marinated in olive oil, lime and garlic. The dory fish was also fresh and tender, flavoured with lemon juice, spices and coriander, flame-grilled to perfection. It was surprising my favourite of the skewers as I just loved the way the fish fell tenderly from its stick. The chicken was tender and lightly seasoned with oregano and pepper. It was pleasant, although I preferred the seafood skewers more. There was also a sweet capsicum, mushroom and tomato veggie skewer which went well with the lamb cutlet. The platter also came with pickles, a corriander and tomato salad and a large bowl of pita bread to dip into the creamy house-made garlic dip. The hummus and olive oil combination was also quite delicious. I was thoroughly impressed with the size of the plate because it was a good amount of food - a generous serving of skewers, bread and salad, although you'd definately be able to order a few more side dishes if you really wanted to try out some of their other interesting entrees. I also tried one of the syrups on offer - The rose and lychee syrup. It was a beautiful colour with a soft, rose scent that was quite lovely. But it was very, very sweet. Perhaps a little too sweet for my usual tastes as I couldn't finish it. But if you like very sweet drinks, this one's for you! I was also fascinated with their platter for two, which looked like a Lebanese high tea, so the waiter let me take a photo of one coming out to be served. 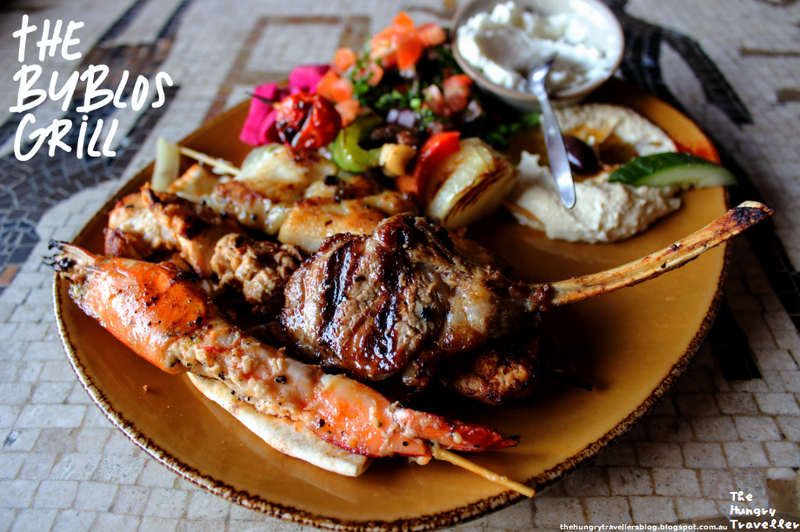 If you're dining with a friend, these tiered dishes offer a good variety of Byblos' popular dishes to share, with 2 of each of the Rekakat, Fatayer, Lahim bil Ajeen, Sambusek, Shish Tawook and Lahim Meshwi. The next time I feel like Lebanese, I'm bringing a friend to try this with me! In the end, I had a great time and enjoyed the delicious meal. The food was nicely presented and came out quickly and the restaurant itself was quite pretty with its decadent lamps and curtains - a great place for grabbing lunch if you happen to work around the WTC Wharf. Although the restaurant is hidden away next to the Crowne Plaza Hotel, it's got some delicious grilled food, so make sure you check it out if you're around that side of town. Disclaimer: I dined as a guest of Clemance Harvey PR and Byblos. This post reflects my honest experiences and opinions at the time of my visit. Please note, I'm a blogger who enjoys food and photography, not a professional critic for a particular media organisation or company. Worth Visiting? Yes, that grill is just perfect.